As promised here is the latest knit and knotted project. 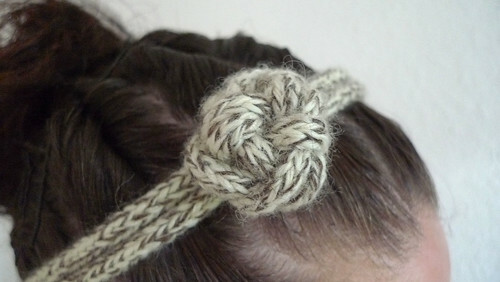 A cute headband with a flower like knot. 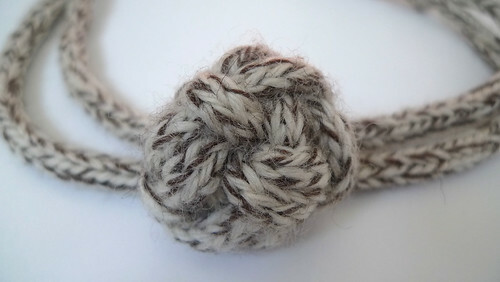 It was made in the same way as the knit coffee cozy, using Lion Brand Yarn's Fishermen's Wool in Oak Tweed for the rope. The sort of flower is a round mat that is tied tight so it doesn't lie flat and has more texture. Tuesday is the start of my new craft series. I can't wait to share these new projects with you!